Expecting mama friends, this one is for you. There is nothing in the world that compares to what life is like postpartum. The drastic change in hormones, being responsible to care for your new little one 24/7, what feels like endless sleepless nights, possible recovery from birth complications . . . well, you get the point. Don’t get me wrong, bringing a child into the world and becoming a mommy has been the most empowering and rewarding thing I have ever done. But it has also been the most challenging thing I have ever done! So today I want to share with you some of the things that has most helped me enjoy these new days of being a mama. I know, it may seem impossible to sleep when the baby is sleeping, especially if you are anything like me and want to get the laundry done, clean the whole house, and have a home cooked meal ready by 5 p.m. But this is one thing I wish I would have done more of – rest. The laundry will still be there and others can help out with the cleaning and cooking. If baby is fed and sleeping, YOU should focus on eating and sleeping. Prepare to feel like your stomach is a bottomless pit the first couple months postpartum. Especially if you are breastfeeding. I have never eaten more in my life. I’m talking ‘you will want to eat six meals a day’ hungry. But quality is key here. Be sure what you are eating is nutritious. My meals generally consist of fiber, protein, fruits, and vegetables. I went dairy free when my little guy was a few weeks old and aside from gluten-free oatmeal, I generally avoid grains. No woman should worry about body weight after delivery, but I will say that my body returned to pre-baby weight in about 12 weeks simply by eating nutritious foods and breastfeeding. (Breastfeeding burns around 500 calories a day!) It’s amazing how the body naturally resets itself when treated with love. So when family or friends are able to help out with the wee one, meal prep! Grill up some marinated chicken and prepare fruits and veggies to be pulled out of the fridge for whenever you feel like eating. 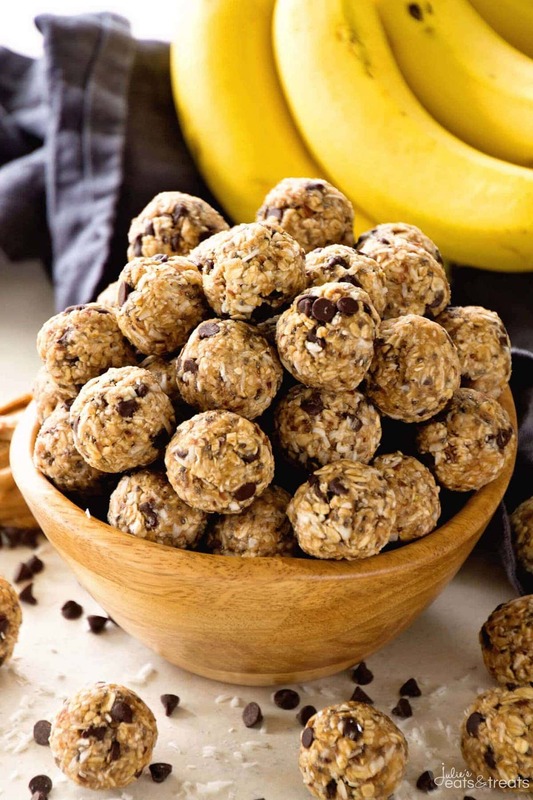 And keep your freezer stocked with oatmeal balls. In case you haven’t heard of these, they’re a great source of fiber and will help maintain your milk supply. Here is a great recipe if you’d like to whip up a batch. If you’re dairy-free or have food allergies, Enjoy Life makes delicious semi-sweet baking chocolate chips, and Bob’s Red Mill offers high quality, gluten-free oats. Drink all the water. Aim to drink your body weight in ounces, but if that’s too much to handle, try for at least 100 oz. of clean filtered water a day. Staying hydrated will help with your energy levels, milk production, and overall feeling well. I love my BKR glass water bottle! It holds a liter of water so you don’t have to make as many trips to refill. And it’s super cute. I know, you’re exhausted. But getting out of the house even for a 30 minute walk can have a tremendous positive impact on your day. Fresh air and sunshine does the weary soul so much good! I’m four months in and these daily walks have become something that I look forward to each day. Even when I am feeling tired I still get outside to walk because of how great I feel afterwards. This was difficult for me at first as I had a C-section due to birth complications, but even at a week postpartum, I was outside walking. Granted I was walking very slowly, but I was walking nonetheless, and this really helped speed up my recovery time. Then when you’re ready, incorporate a workout if you’re feeling ambitious. I have found yoga to be super helpful with back pain & soreness that comes from lugging a baby and baby gear around! You read that right – treat yourself! Take that bubble bath, get your nails done, get a facial, or indulge in whatever it is that makes you feel a tad bit spoiled. You GIVE all day (and often all night long), so you should never feel guilty for taking a few minutes for you. My jam? Going for a run outside, diffusing essential oils, practicing yoga, and using my Beautycounter products are just a few of my favorite things that always leave me feeling relaxed and pampered. I know this one can be a bit difficult if you do not have many local friends and family to lean on, but accept any help that is offered. And don’t hesitate to reach out to someone you trust to help out when you need it. Join a mommy’s group if you can. Sometimes these are affiliated with your hospital or birthing center. I have recently joined one and really wish I would have started going sooner. It’s super encouraging to be around other mama’s. Online support is great too, so join those Facebook groups where you can ask bizarre questions to like-minded moms at 2 a.m.
I’d also like to add here, keep your emotional health in check as well. I know from experience what the sleep deprivation in combination with the newness of being a mom and the hormone changes can feel like! Don’t hesitate to vocalize your feelings to an expert or to other moms who have been there. If you’re a reader, grab a book . . . or 10. 😉 And add variety! I educated myself by reading books on parenting, natural birth, breastfeeding, nutrition for babies, vaccines, and so many more. But I didn’t limit myself to books on just one parenting style or school of thought. You may find that what you have in mind for your baby (sleeping arrangements, for example) may not turn out to be best for everyone, so it’s helpful to be able to draw techniques from a variety of experts. We are ultimately responsible for our health, and as this truth has resonated with me over the past few years, I have taken a lot of interest in natural health alternatives. I did everything I could while pregnant to stay healthy and ensure my baby arrived healthy. I planned for a natural birth – free of any medical intervention and medications. I did everything I knew to promote a natural delivery throughout my pregnancy – nutrition, exercise, chiropractic care, and reading (I became an Ina May fangirl from reading her empowering birthing books, which I totally recommend by the way). But while we are responsible for our health, we aren’t completely in control. I’ll add my birth story soon to my blog – but long story short, my baby was born urgent c-section. This came as such a shock to me as I didn’t prepare for this or had even considered c-section a possibility. This news was really difficult to handle emotionally in the moment, and I wish I would have been mentally prepared for this reality. So that’s my last tip to expecting mama’s. Prepare for all possible outcomes. Do all you can to physically prepare your body for the birth you desire, then mentally and emotionally prepare for alternative possibilities. Perfect post for expecting moms. You’ve done a great job here covering it all.